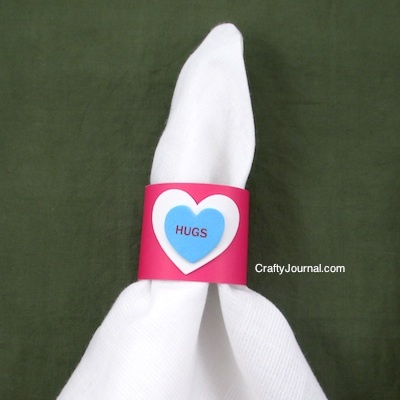 For a last minute place setting decoration, create these quick Valentine napkin rings. 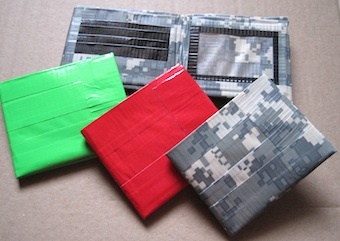 They are easy enough that even preschoolers could help you make them. And they would be fun for a Valentine or classroom party. I found the conversation hearts at Target’s Dollar Spot, and the plain heart stickers at the Dollar Store. You can make your own hearts with craft foam if you can’t find them in the store. 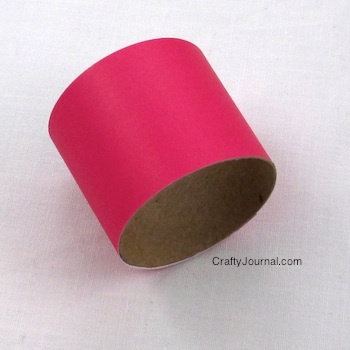 How to Make Quick Valentine Napkin Rings. 1. Cut the cardboard rings 1 1/2 inch wide. 2. Cut strips of colored paper 1 i/2 inch wide. Make them long enough to overlap by an inch or so. 3. Using double sided tape, attach one end of the paper strip to the cardboard ring. Wrap the paper strip around the tube, overlapping the edge and tape the other end down. 4. Choose a larger heart for the bottom heart and a smaller heart of a different color to go on top. 5. Center the smaller heart on the larger heart and attach it. 6. 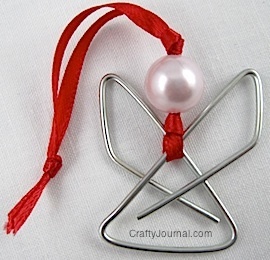 Attach the larger heart to the napkin ring, and it’s ready to be used. 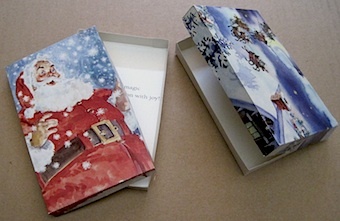 Let the kids color or draw on the paper strips before you attach them to the cardboard ring. Write each person’s name on a napkin ring. If you can’t find conversation hearts, use markers to write your own messages on plain hearts. So cute! I’m thinking of reworking them for my daughter’s first birthday in March =) I’d love it if you’d share. Another fun and inexpensive way to celebrate Valentine’s day with the kids! Thanks for sharing your great ideas at TTF! Such a sweet idea 🙂 thanks for sharing. .. I love upcycling! I love that you made the tp tubes useful instead of throwing them out, and they are super cute to boot! Thanks for linking it up to Snickerdoodle Sunday. Visiting from A Pinch of Joy-Busy Monday … WOW what a cute and quick idea … LOVE it!! These are so fun! My boys would love to help make them…Thanks for sharing at Hit Me With Your Best Shot! OH, these are great!! We may have to make some for my daughter’s party. Thank you for sharing at Sharing Saturday! This will be a fun activity to do with the kids so we can enjoy our Valentine dinner in style! Thanks so much for linking it up at the “This Is How We Roll Thursday” link party! I love quick and easy ideas like this! My grands would love making something like this. Thanks for sharing with SYC. So cute! I’ll have to pass this onto my daughter for her Sunday School class! Thanks for sharing at the #HomeMattersParty – We hope to see you again next week.